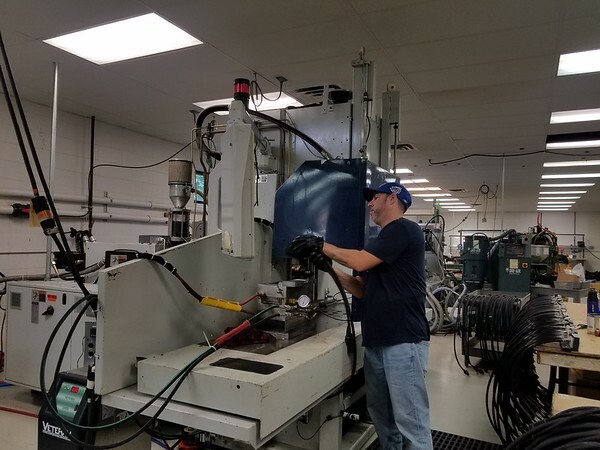 NEW BRITAIN - Integro is a local manufacturer that focuses on being innovative and keeps up with technologies to provide solutions for different industries it serves. Located at 30 Peter Court, Integro was founded in 1995 by Rick Knight, a retired chief executive officer. The company has been adding new technologies within the last five years such as patented Radio Frequency Identification (RFID) technology, patented airfield lighting connectors, patented light-emitting diode (LED) lighting systems and state of the art solar harnesses. The products at Integro include underground power for the lights on airport runways, power distribution temporary lighting and welding equipment used to manufacture navy vessels, navy ships as well as large commercial ships and submarines. The company also serves the mining industry. Integro manufactures the extension cords that plug from the battery to the cap lamp in mining hats. “Pretty much every U.S. miner has our product,” Bogart said. Even though the company is successful in all the markets it serves, airfield lighting is the biggest market for Integro. The company’s three biggest customers are Hartsfield–Jackson Atlanta International Airport, O’Hare International Airport in Chicago and Heathrow Airport in London. “We are on every major airport in the U.S. and very many worldwide,” Bogart said. Bogart added that the team at Integro has worked hard over the last several years to partner with big electrical companies such as the largest cable manufacturer in the world and one of the largest electrical connector companies in the world. The goal of these partnerships is to offer better solutions to the markets they already serve. Integro has 35 employees and works with Central Connecticut State University through which interns can learn, practice and develop skills. Michelle Skinnon, vice president of sales and marketing at Integro, said she enjoys the environment provided at her workplace. Mayor Erin Stewart visited Integro in 2015 soon after the company celebrated its 20th anniversary. “We like being a part of the New Britain community, we think the city has provided us a great foot print to go ahead and grow our business,” Bogart said. To learn more about Integro visit www.integro-usa.com . Posted in The Bristol Press, General Business, Manufacturing on Monday, 8 October 2018 20:15. Updated: Monday, 8 October 2018 20:17.